Right now. Immediately. Blueberries are at their most succulent, plentiful and affordable best. Quick before the season wanes, stock up. Gorge. 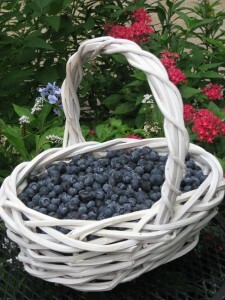 My single favorite blueberry recipe comes from my husband’s grandmother, Esther Milder. Esther would be about 120 years old if alive today, which of course she isn’t, but her recipe is, and it keeps her alive in the hearts of generation after generation of blueberry muffin lovers. Preheat oven to 350 degrees. Grease 24 muffin cups and set aside. Mix flour, sugar and baking powder in a large bowl. Cut in 1/2 cup butter with a pastry blender or two knives used scissor fashion (or use your fingers to squish the flour and butter into crumbs). Put one cup of crumb mixture in a small bowl and set aside. To mixture in large bowl, add eggs, milk and vanilla and beat until smooth. Gently fold blueberries into batter. Spoon batter into muffin cups. Melt 2 tablespoons butter and dribble over flour mixture in small bowl. Toss with a fork to make crumbs. Sprinkle crumbs on top of batter in muffin cups, dividing crumbs equally. Bake until muffins are light golden brown on top, 20 to 30 minutes. Cool muffins before removing from pan.